Forest City Gallery’s newest Intern, Janeen Mills, visited McIntosh Gallery earlier this month to view Ron Benner’s Three Questions. Below, Janeen offers some observations about the first time she viewed the immersive retrospective of one of London’s most prominent artists. Local London Artist, Ron Benner has been an important influence within London’s art community. 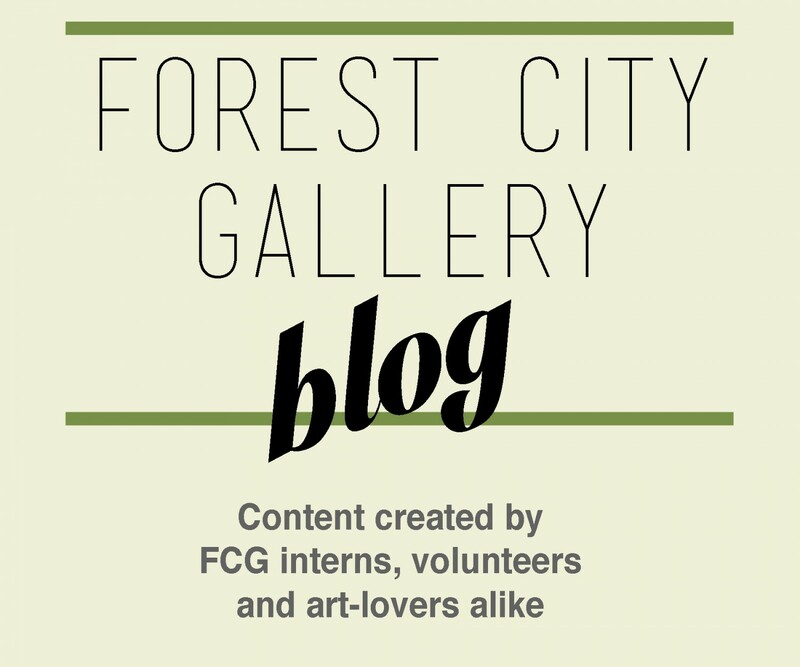 As one of Forest City Gallery’s founding members, he has built an impressive reputation for himself through exhibiting around the world and has become internationally recognized. Benner’s current exhibition at the McIntosh gallery, Three Questions, features his life’s work. Curated by Julian Haladyn, Three Questions consists of mixed-media photographic installations, which Benner has been creating for over three decades. Consisting of three different spaces that connect the narrative of the artists’ continual journey to seek truths within systems of knowledge specifically associated with agriculture, farming and the movement of crops around the world. Benner’s work is typically political in the way he brings awareness to social issues, which Three Questions does not shy away from. 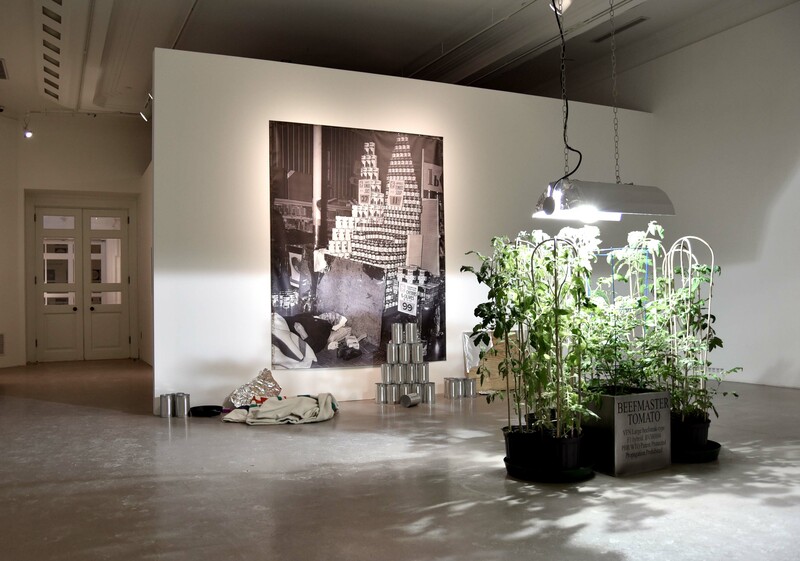 The exhibit’s theme centers on the social and political impacts surrounding trade, agriculture and plant science of which the artist has been investigating for thirty years. The installations are specific to Benner’s research and experiences encountered throughout his travels around the globe. Upon entering the gallery space I immediately knew that Benner’s and Haladyn’s intention was to have the space interact with the viewer through showing his process. 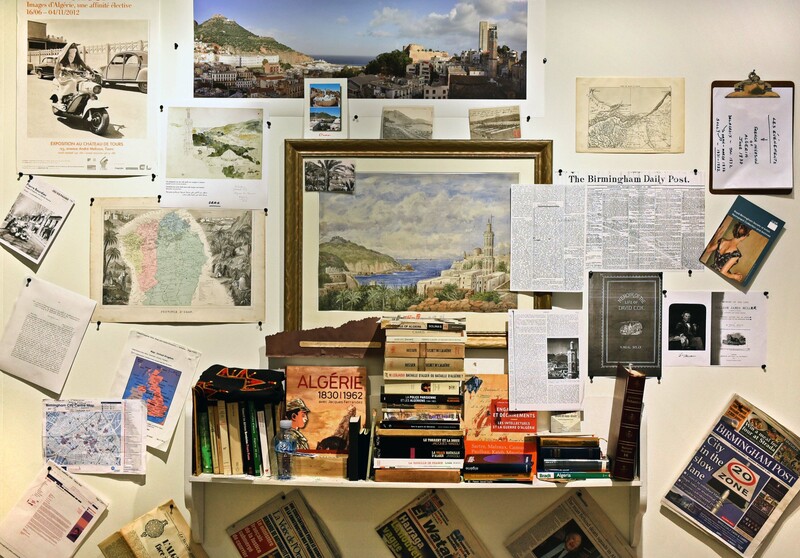 The foyer of the gallery is cluttered with Benner’s notes, research and findings accompanied by a video which shows Benner in the midst of his process for this exhibit. The viewer sees Benner taking notes and flipping through books on a continuous loop. The viewer is immersed in Benner’s haphazard process of researching and able to observe how his practice unfolds. The first space I entered, Transcend: Meeting Room, appeared like a small pseudo library with bookshelves in each corner of the room. The books, from Benner’s own personal collection all had a similar theme dealing with indigenous farming and the political economy in relation with food, farming and agriculture. From the bookshelves black and white photographs emerge, arranged in a grid covering the remainder of exposed wall. Taken during Benner’s continual travels the photographs depict plants, agriculture and markets from around the world. What drew my eye in this space were sketches of sea monsters inserted between these photographs. Originally, made as coasters for a previous exhibition, Benner recycled these pieces and transformed their use in order to add to his current practice and further challenge theoretical models of belief. The sketches of the sea monsters complement the space yet are a curious highlight, which causes viewers like myself, to question their purpose. At first glance the connection of the sea monsters within the exhibit seems ambiguous, but the sea monsters encourage the viewer’s speculation create a dialogue. The sea monsters symbolize suspicion of reality and truth within systems of knowledge. They evoke skepticism within the space and draw on Benner’s theme of myth and falsities within the knowledge to the origins of farming and agriculture, which lacks recognition of indigenous people’s contribution, our current abundance in crops. In the center of the space, a transparent Plexiglas table, encases a triangular ray pattern of indigenous crops. The crops emanate towards its center where a map of colonial trade routes rests. The map highlights trade routes, which were travelled by colonialist to transport goods to Europe and throughout its colonies during the 1500’s. The crops within the table symbolize plants brought to Europe and North America from the Americas through the destructive process of colonialism. Benner uses the table as an artistic allegory to convey the common misconception that plants, such as: potatoes, beans, peanuts and tomatoes are native to North America and Europe. The next space I explored, Why is the Tomato to Blame?, highlighted a cluster of tomato plants in the center of the space with UV lights above. The tomato plants are labeled their scientific name’s, one of which is a genetically modified hybrid called F1 “Beefstake”. Sitting beside a normal tomato plant, the Beefstake plant has been altered to no longer produce seeds. Rather, the only entity in possession of the hybrids seeds is the person that holds the patent or who has been given permission to have. Plants have always offered their seeds to anyone who could access them, but with improvements in plant science this has been altered. In connection two large photographs also juxtapose what the agricultural industry has become. The first photograph is of a woman in India selling tomatoes, taken in 1997 by Benner and the second taken in 1960 of an elderly woman laying on a grocery store floor, killed by a fallen pyramid display of Campbell’s tomato soup cans. Upset by the photo of the elderly woman, I realized that the woman from India holding a scale was representing the scale of justice. Western society took stole from Indigenous cultures for its own gain and wrote them out of history. As a result of Western society trying to get ahead, those most vulnerable are the ones that suffer. The last space, Wh…?, ties the entire exhibits theme together. Taken from an old barn that had blown over during a storm, the tin letters spell out, “Where will you be in eternity?” Driving past this barn as a child, Benner was always drawn to this question, which became an important aspect within his practice to always question the norm. Accompanied by pictures of the barn before it was destroyed, Benner poses this question to viewers as a way to convey the message that not everything we learn is truthful and to challenge dominant hegemony. Benner refutes Eurocentric superiority prevalent in Western society and allows viewers to reflect on the impact of belief in falsities and encourages viewers to discover the truth for themselves. Benner, Ron. “Ron Benner: Three Questions.” Presentation at Mcintosh Gallery, Western University, London, Ontario, January 21, 2015. Benner, Ron. “Ron Benner: Three Questions.” (presentation at Mcintosh Gallery, Western University, London, Ontario, January 21, 2015).